Schematic scheme of a spidroin consisting of an assembled C-terminal domain (cyan), the unfolded central domain (white line) and the N-terminal domains (green). Right hand side: scheme of a tapering spinning duct. A team of researchers at the Julius-Maximilians-Universität Würzburg in Germany have investigated the molecular nature of spider silk in an attempt to better understand the structure, assembly and complex mechanical properties of one of the toughest fibres in nature. The work could help material scientists to reproduce natural spider silk – known for its lightness, near invisibility and highly extensibility and strength, as well as being biodegradable, making it of interest for commercial or industrial applications in aviation, textiles and medicine. Although artificial spider silk can be made in the laboratory, the molecular-level responsible properties are not well known. 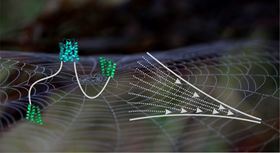 Web spiders synthesize silk fibers that offer unique strength and extensibility based on the controlled self-assembly of protein building blocks called spidroins, which are assembled within the spinning gland of spiders. The terminal ends of spidroins play a specific role in this process, with their two ends being terminated by an N- and a C-terminal domain. In this study, reported in Nature Communications [Rat et al. Nat Commun. 2018 DOI: 10.1038/s41467-018-07227-5], the focus was on the C-terminal domain, which connects two spidroins through the formation of an intertwined structure similar to a molecular clamp. They observed that the clamp self-assembles in two discrete steps, with the first comprising association of two chain ends, and the second the folding of labile helices in the periphery of the domain, a process that may contribute to extensibility. The stretching of spider silk is associated with unfolding of the helix, and previous research has found that extensibility goes back to the unfolding of helices in the central segment of spidroins. Here, they propose that the C-terminal domain might also act as module that contributes to extensibility. To that end, the team explored the protein building blocks of the nursery web spider Euprosthenops australis, using genetic engineering to exchange individual moieties of building blocks and altering the protein chemically with fluorescent dyes. In addition, the interaction of light with soluble proteins showed that the domain assembles in two discrete steps. As team leader Hannes Neuweiler told Materials Today, “we discovered a previously unknown two-step mechanism of folding that shows that the domain assembles and disassembles in steps. This may have implications for fiber mechanical properties”. Although the hypothesis can be inferred from these results, whether the C-terminal domain of a spidroin modulates fiber extensibility has still to be shown. If it does, there may be opportunities for industry to modulate its properties by modulating molecular properties of the C-terminal domain of synthetic spidroins. The researchers now hope to look into C-terminal domains from other spider silk glands and species to see if the mechanism of self-assembly of this domain is conserved.